Get flawless makeup look that holds up even under the most extreme conditions! 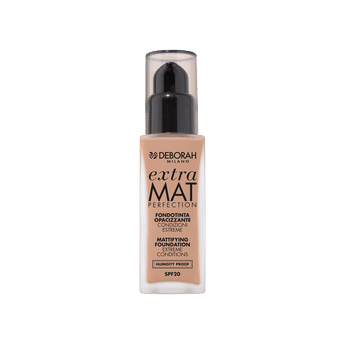 Deborah Milano Extra Mat Perfection Foundation is a fabulous transfer and humidity proof foundation formula that won't let you down even when it's scorchingly hot and swelteringly muggy. This foundation keeps shine at bay even in the T-zone, yet delivers the hydration that skin needs at all times. It protects skin from harmful effects of pollution and UV rays. The Extra Mat Perfection keeps make-up looking freshly applied all day long whether you're rushing through back-to-back meetings or putting yourself through your paces at the gym. The foundation comes in a contemporary glass bottle and easy to use and apply. Alternatively, you can also find many more products from the Deborah Milano Extra Mat Perfection Foundation range.